Lawn & Turf food. For use on Couch, Buffalo, Shade & Broad Leaf lawns. Also ideal for turf fields & parks. Can also be used on Palms, Cycads & Citrus trees. N 11.9%, P 2.0%, K 8.0% Enriched with Zeolite, Silica, Rock Minerals, Guano, Carbon, Microbes, Minerals, Wetting agent & Trace elements. Lawn & Turf Food $14.95 Special price: $0.00. Not online sale. 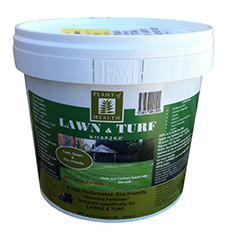 Lawn & Turf Food $35.20 Special price: $0.00. Not online sale.